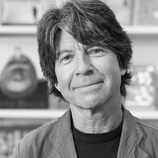 While growing up in Yorkshire, England, Anthony Browne spent hours drawing with his father, an influence that stayed with him into adulthood. He says of his father, “He was an unusual man—outwardly strong and confident, but also shy and sensitive—a bit like the gorillas I love to illustrate now.” After studying graphic design, Anthony Browne went on to paint illustrations for medical textbooks for three years, then switched to designing greeting cards. This, in turn, led to creating children’s books when a greeting-card gorilla decided to take on a life of his own. The father of two grown children, Anthony Browne lives with his wife in Kent, England.